After the success of gambling movie From Vegas to Macau <賭城風雲>, director Wong Jing (王晶) followed up with a sequel. Chow Yun Fat (周潤發) returns in the sequel, with the addition of Best Actor Nick Cheung (張家輝) to set new sparks. The film takes place in Thailand, in which Chow Yun Fat is responsible for the apprehension of Nick – a runaway who has the book of accounts of the illegal activities of his company. The chase brings both to an underground casino looked after by the hostess, played by Thai actress, Poy, whose bodyguards immediately attack Nick with knives. As Nick’s daughter (Angela Wong 王詩齡) is unfortunately kidnapped, Nick quickly escapes to rescue his daughter by jumping onto a moving truck carrying a load of durians with Chow Yun Fat. Unfortunately for the two actors, they suffered minor injuries from being cut by the durians. 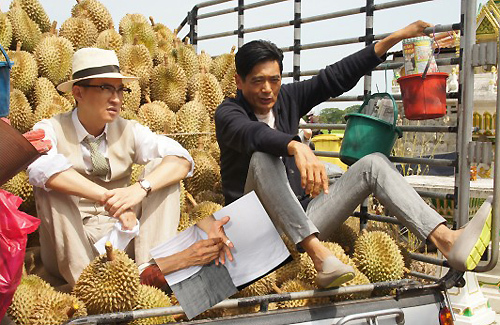 Chow Yun Fat’s thumb bled while Nick almost got hit in the crotch area by the sharp fruits. Despite some cuts and bruises from filming action scenes, Chow Yun Fat and Nick remained in a good mood, often joking with the production staff. After filming the last scene for the day, the production crew celebrated by taking a group photo for memories. Unlike other artistes that fight for the spotlight, both Chow Yun Fat and Nick refused to stand in the center spot and did not want the attention to focus on them. Speaking with the press afterward, Nick surprisingly admitted that he suffered from insomnia nearly every day because of the pressure in collaborating with Chow Yun Fat. The epitomy of great and unselfish actors who do not call attention to themselves but have e desire to share the limelight with others. Kudos! From Vegas to Macau was pretty bad. Hope this one is miles better. First one was good. Hopefully this one will be even better especially cause they added Nick Cheung. They’re great actors especiall Fatt Gor. But I personally prefer Fatt Gor to put on a bit of weight, he’s way too thin now eventhough he deems healthy. I’m so glad Nick is doing more light hearted movie. He’s a great all rounded actor and I really miss his comedic side after years of police, serious and darker side movies which dominated his works for almost the past 10 years. Also like Fat gor too! I love Fat Gor! Feel sorry for Nick being hit in the crotch by a durian. But my first reaction was to laugh. (Sorry Nick! =P) Hmmm. Maybe they should put that in the plot as well to add to the comedy. They should do more movies together. They seem like they would be a natural complement for each other’s acting styles. I also can’t wait to see this one!